FOX+ presents "The Good Fight." Following the highly acclaimed political drama "The Good Wife" is spinoff-sequel "The Good Fight." 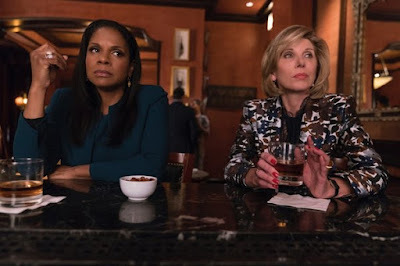 Christine Baranski reprises her role as Diane Lockhart who now takes center stage in this follow-up show, which is still led by creators Robert and Michelle King. Taking place a year after the finale of "The Good Wife," viewers follow Christine as she is pushed out of her law firm after a financial scam destroys both her savings and the reputation of her goddaughter. The tragedy then causes the two to join one of Chicago's leading law firms. Currently finishing its second season, "The Good Fight" has received positive reviews and plenty of praises from critics and viewers alike. Just like its predecessor "The Good Wife," many have admired "The Good Fight" for its story arcs and overall themes. Here's what some of the Filipino fans of the show have to say about this legal drama. "Well for one, I really liked The Good Wife already so I knew I would like this show. But I think that even if you just watch The Good Fight, you'd still enjoy it," Karl Jingco, a 23-year-old actor from Taguig, said. "It's a challenge to me to grasp the stories and legal talk, but in a good way. I feel like I'm learning. Plus, the relationship between Christine and Maia is very complex and interesting to watch." True enough, the show does not shy away from the true complexities and jargon of law firms, staying very authentic. 19-year-old Sociology student Lloren Tuano, on the other hand, said that she enjoys the show because of the way it tackles very timely issues. "I think it's very relevant, especially because it talks about the current U.S. government and everything," the Novaliches resident said. "It's brave of them to be upfront about it -- it's very strong social commentary. Also, I love that it has strong and smart female leads that I can really look up to and relate to," Tuano said. "The storytelling is so compelling," Graphic designer Kevin Matsuyama said. "The drama and humor really keeps you watching and wanting more." Matsuyama, a 22-year-old from Taguig, joins many other fans who have also lauded "The Good Fight" for its writing, particularly its snarky comedy and gripping story arcs. "And of course, the shots are beautiful. It's a very well crafted show. A bonus for me is how some characters of The Good Wife appear every now and then too," Matsuyama said. While many spinoffs don't necessarily make it very far and are often written off by viewers, "The Good Fight" surprised audiences by standing its own and delivering great entertainment. While fans everywhere are highly anticipating the finale of the second season, the show proves that some things can indeed get better the second time around. Be the first to stream all seasons and the season 2 finale of "The Good Fight" on FOX+.